↑ Georg, Feuerstein (2002). The Yoga Tradition. Motilal Banarsidass. pp. p.600. ↑ Clarke, Peter Bernard (2006). New Religions in Global Perspective. Routledge. pp. p.209. "The first Hindu to teach in the West and founder of the Ramakrishna Mission in 1897, Swami Vivekananda,[...] is also credited with raising Hinduism to the status of a world religion." ↑ Jeffrey Brodd; Gregory Sobolewski (2003). World Religions: A Voyage of Discovery. Saint Mary's Press. pp. p.275. "In 1897 Swami Vivekananda returned to India, where he founded the Ramakrishna Mission, and influential Hindu organization devoted to education, social welfare, and publication of religious texts." ↑ Smith, Bardwell L. (1976). Hinduism: New Essays in the History of Religions. Brill Archive. pp. p.93. ↑ Miller, Timothy (1995). America's Alternative Religions. SUNY Press. pp. pp.174-175. ISBN 9780791423974. "…Bengalis played a leading role in the wider Hindu renaissance, producing what can be termed the Bengali "Neo-Vedantic renaissance""
↑ Pelinka, Anton; Renée Schell (2003). Democracy Indian Style. Transaction Publishers. pp. pp.40-41. ISBN 9780765801869. "The Bengali Renaissance had numerous facets including the spiritual (Hindu) renaissance, represented by the names of Sri Ramakrishna and Swami Vivekananda, the combination of spiritual, intellectual, and political aspects…"
↑ Bhattacharyya, Haridas (1978). "Part IV : Sri Ramakrishna and Spiritual Renaissance". The Cultural Heritage of India. University of Michigan: Ramakrishna Mission, Institute of Culture. pp. p.650. ↑ Jackson, Carl T. (1994). Vedanta for the West. Indiana University Press. pp. p.78. ISBN 9780253330987. ↑ ११.० ११.१ Dehsen, Christian D. Von; Scott L. Harris (1999). Philosophers and Religious Leaders. pp. p.159. ↑ Cyrus R. Pangborn. "The Ramakrishna Math and Mission". Hinduism: New Essays in the History of Religions. pp. p.98. ↑ "Belur Math". Retrieved 2008-10-26. ↑ "The Birth of Ramakrishna". Ramakrishna and His Disciples. pp. p.13. ↑ Transformation of Ramakrishna. pp. p.70. "The point to be made is that we are not dealing with an uneducated or ignorant ecstatic. Rather, because of his intelligence, his interest, his own study and his subsequent contact with Hindus of all schools of thought, we should realize that we are dealing with a well versed Hindu thinker who, because of the ecstatic nature of his religious experience, refused to be bound in and restricted by what he viewed as dry, rationalistic requirements of systematic discourse." ↑ Bhawuk, Dharm P.S. (February 2003). "Culture’s influence on creativity: the case of Indian spirituality". International Journal of Intercultural Relations (Elsevier) 27 (1): pp. 1-22. "Scholars have called him "the illiterate genius"". ↑ १७.० १७.१ Isherwood, Christopher (1974). Ramakrishna and His Disciples. 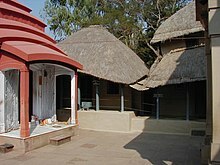 Advaita Ashrama. pp. p. 28. ↑ Muller, Max (1898). "Râmakrishna's Life". Râmakrishna his Life and Sayings. pp. pp.33. http://www.sacred-texts.com/hin/rls/rls14.htm. ↑ Saradananda, Swami. The Great Master. pp. p.59. ↑ Nikhilananda, Swami (1942). "Chapter 20 — RULES FOR HOUSEHOLDERS AND MONKS". The Gospel of Ramakrishna. http://www.belurmath.org/gospel/chapter20.htm. "During my boyhood I could understand what the Sadhus read at the Lahas' house at Kamarpukur, although I would miss a little here and there. If a pundit speaks to me in Sanskrit I can follow him, but I cannot speak it myself.… The realization of God is enough for me. What does it matter if I don't know Sanskrit?" ↑ Swami Nikhilananda. The Gospel of Sri Ramakrishna. Ramakrishna Math, Chennai. pp. p. 4. ↑ नीवेल्. श्रीरामकृष्णस्य परिवर्तनम्. pp. पृ.७०. ↑ नीवेल्. श्रीरामकृष्णस्य परिवर्तनम्. pp. पृ.६८. ↑ "The Boyhood of Ramakrishna". Ramakrishna and His Disciples. pp. p.37. ↑ Isherwood, Christopher (1974). Ramakrishna and his Disciples. Advaita Ashrama. pp. pp. 55–57. ↑ Muller, Max (1898). "Râmakrishna's Life". Râmakrishna his Life and Sayings. pp. pp.37. http://www.sacred-texts.com/hin/rls/rls14.htm. Neevel, Walter G.; Bardwell L. Smith (1976). "The Transformation of Ramakrishna". Hinduism: New Essays in the History of Religions. Brill Archive. Sen, Amiya P. (9 April 2010). Ramakrishna Paramahamsa: Sadhaka of Dakshineswar. Penguin Books Limited. ISBN 978-81-8475-250-2. http://books.google.com/books?id=19HUeX3JygwC&pg=PT56. Tyagananda; Vrajaprana (2010). Interpreting Ramakrishna: Kali's Child Revisited. Delhi: Motilal Banarsidass. p. 410. ISBN 978-81-208-3499-6. http://www.interpretingramakrishna.com/. Bhawuk, Dharm P.S. (February 2003). "Culture's influence on creativity: the case of Indian spirituality". International Journal of Intercultural Relations (Elsevier) 27 (1): 8. doi:10.1016/S0147-1767(02)00059-7. Raab, Kelley Ann (1995). "Is There Anything Transcendent about Transcendence? A Philosophical and Psychological Study of Sri Ramakrishna". Journal of the American Academy of Religion (London: Oxford University Press) 63 (2). JSTOR 1465404. Smart, Ninian (28 June 1998). The World's Religions. Cambridge University Press. ISBN 978-0-521-63748-0. http://books.google.com/books?id=cC3uYLZJ8ZgC. Schneiderman, Leo (1969). 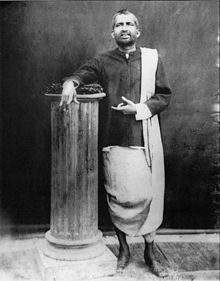 "Ramakrishna: Personality and Social Factors in the Growth of a Religious Movement". Journal for the Scientific Study of Religion (London: Blackwell Publishing) 8 (1): 60–71. doi:10.2307/1385254. JSTOR 1385254.